We made a "painting" tool to create a lot of board illustrations we needed for explaining rules, board setup, pieces moves and captures. it's open source. We intend to make our "database" of diagrams Grow with your help. We also would like you suggest improvements of the diagrams you don't like. Don't hesitate to post here sketches etc. Thank you, the "boardpainter" is really great! 1.I would like to have different colors for different arrows. For example, an arrow is green, another arrow is red. But at the moment this does not work, all arrows always have the same color. 2. I would like to be able to highlight individual fields/squares in Color. McGoohan wrote: Thank you, the "boardpainter" is really great!. Yes I was thinking of cells selection. And different arrow colors would be nice too. But it needs time and I'm not working on this for the moment. Now the code is open, maybe someone could make this kind of upgrades. Another update of the Board Painter with more than 20 new pieces including: Lioness, Bear, Wolf, Dog, Dragon (real figural dragon), Griffin, Mammoth, Atilla (or Eagle), Warrior, Wildebeest, Glider, Wizard, Antilope, Bull, Rhinoceros, etc and much more. Board Painter was updated with much more designs and diagrams. A slight bug to be fixed but overall it works fine. 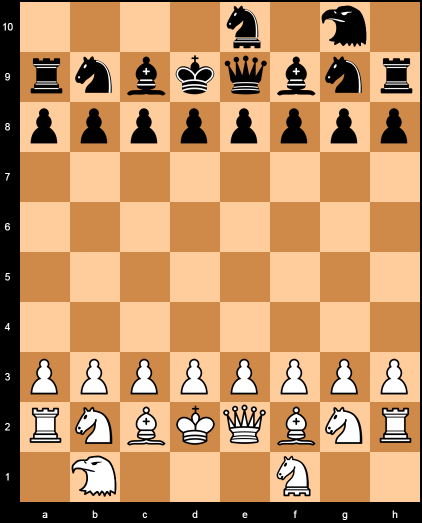 the Musketeer Chess BoardPainter has been updated. new feature added : piece rotation. Use the North, South, East and West orientation links to modify the current brush. You can also use N, S, E and W keys as shortcuts for these rotations. Github version repository has been updated the same way. I am trying to create musketeer board, but could only come up with the following. The rank notation is only the issue, would be great if a user can change the rank numbering. Should be 0 to 9 in this case. we will make a slight change, add Musketeer Option = When coted, Musketeer Option will make the file notation beginning from 0 ( and not from 1).